Apparently Mrs. White had subscribed to Bates' theory that the open space in Orion was a special, heavenly gateway. Thus, she put the prophetic stamp-of-approval on his conjectures about Orion. There is an "opening" or stargate into "a region more enlightened"
The voice of God comes through an "open space in Orion"
"In The Orion Mystery we presented graphic as well as written evidence showing how important the Egyptians considered the constellation of Orion to be. We published an illustration based on a drawing from the ceiling of the tomb of Senmut, companion and vizier to Queen Hatshepsut. In this picture Sahu/Orion is shown standing in a small boat with three prominent stars representing Orion�s belt) over his head. This figure carries in his left hand a staff of office, while in his right he holds an ankh�the Egyptian hieroglyph usually translated as �life.� Behind him, following in her own boat, is a goddess identifiable as representing the star Sothis or Sirius. Another diagram showed part of the ceiling painting from the mausoleum of Seti I, one of the greatest of the New Kingdom pharaohs and father of Ramses II. 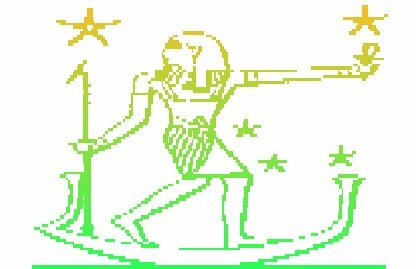 In this drawing Orion is again shown in his boat with the staff in one hand and an ankh in the other, above which is a five-pointed star. A third illustration of Orion came from the Cairo Museum, custodian of the pyramidion that once capped the pyramid of Amenemhet III at Dashur. Being from the Middle Kingdom, this pyramidion is older than the ceilings of the tombs of Senmut and Seti but it carries a very similar representation of Orion. Again he is shown as a walking man holding a staff in one hand, but this time he is cupping a star with the other. The idea that God has a stargate in Orion is found nowhere in the Bible. It appears to have originated in ancient heathen religions and was later adopted by New Agers. What is to be made of Mrs. White's Orion Stargate vision? What makes this all the more unusual is that Mrs. White consistently opposed paganism and the occult in her writings.9 Where then did this vision come from? Did God show her the same truth He revealed to the ancient heathen Eqyptians? Does He really have a stargate in Orion? Or did she fabricate the Orion stargate vision to win the approval of Captain Bates, a prominent leader in the early church? Or was she simply hallucinating? You decide. Why is there an Egyptian obelisk on the White's burial site? 1. James White, editor, The Early Life And Later Experience And Labors Of Elder Joseph Bates, chapter 12, (Steam Press of The Seventh-Day Adventist Publishing Association, Battle Creek, Mich. 1877). Emphasis in the original. 2. Editor's Notes by Blake Linton Wilfong in the Preface to the English translation of Voltaire's Micromegas. http://wondersmith.com/scifi/micro.htm. 3. American Heratige Dictionary, ©2000. 4. J.N. Loughborough, Great Second Advent Movement, p. 258. 5. A.W. Spalding, Pioneer Stories of the Second Advent Message, chapter 17, "The Opening Heavens and the Unchanged Law", (1942). 6. Arthur White quoting Ellen White in Ellen G. White: The Early Years, Vol. 1 - 1827-1862, p. 154. Same quote is also found in Early Writings, p. 41; The Present Truth, August 1, 1849, "Dear Brethren and Sisters"; The Present Truth, January 31, 1849, "To Those who are receiving the seal of the living God". A similar statement was made in an unpublished letter, Letter 2, 1848, written Dec. 18, from Rocky Hill, Connecticut. "...then we could see the open space in Orion from whence came the voice of God. I saw that the Holy City will come down through that open space." The notable difference between Early Writings and this letter is that in the unpublished letter Ellen White said "I saw" in reference to the Holy City descending through the open space in Orion. 7. Barry Martin, The Time Spiral, http://www.spiritwheels.com/writers/kiara/barrymartin.html. 8. Adrian Gilber, Orion�s Mystical Origins From Pre-History, http://www.btinternet.com/~orionmoon/ORION.htm. Photo from web site. Extracts from: Signs in the Sky (Three Rivers Press: 1972. ISBN 0-609-80793-5).